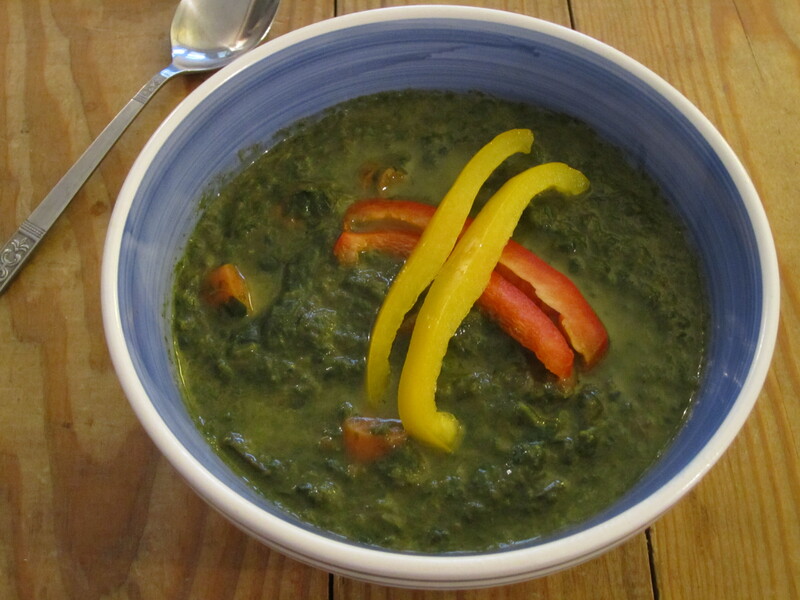 This spicy soup calls for callaloo, a Caribbean vegetable akin to spinach (absolutely delish! ), and Scotch bonnet pepper, an insanely hot Caribbean chili pepper. Unfortunately, my grocery stores stock neither ingredient. Instead, I improvised and used spinach and habanero pepper. It’s an intriguing dish with complex flavors: the heat from the habanero, the freshness from the spinach, the creaminess from the coconut milk and the spicy warmth from the Jamaican allspice. It looks a bit like “lawn in a bowl,” but don’t be fooled. It’s hearty and delish; perfect for those upcoming cool nights. Cook 2 cups of spinach by boiling. When done, then puree in blender and set aside. In a large skillet, heat butter and saute onions, carrots and scallions for approximately 3 minutes. While these are cooking, in a large pot, heat vegetable broth. Add onions, carrots, scallions and butter to broth in pot. Mix well. Boil for 3 minutes on high heat. Add allspice, habenero and fresh chopped spinach. Cook on medium heat for 5 minutes. Remove habenero halves. Add pureed spinach and coconut milk. Season with salt and pepper. Simmer on low heat for 10 minutes. I’m sure this tastes good and all but it looks like something…I can’t place my finger on what that something is….that I probably wouldn’t put back in my stomach. Key words: “back in my stomach”. I’m sure it’s great though. Also, sorry for being so immature. We all know appearences can be deceiving, you can’t judge a book by it’s cover, etc. I do love Habenero peppers, I imagine if one wanted a spicier version of this soup they could leave the seeds in to raise the tongue-burning quotient. Mmmmm…. Tongue burning…. Let me know when the recipe includes ghost peppers. I lived in an old apartment, haunted by the damn things, back in the mid 90’s. Later, you’d get up, pour a bowl of “apple jacks” and there they were, floating in the milk. My roomate was even possessed by one. We called in a gardener to perform an exorcism. Interested on taking a spirit journey, are we?